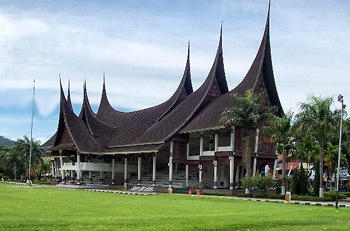 Padang is the capital of West Sumatra. The town is quite nice and deserves a longer visit. The main sights in the city include Adityawarman Museum (close to the bus station) in a traditional Minangkabau house and featuring a good collection of antiques and the cultural center where we can see traditional dances on Sundays. It is an arts institute, which often stages Minang dance and pencak silat (martial arts) performance. The cultural center also offers free tours to the city. Padang has several houses built in traditional architecture, including Padang Museum, which houses objects of cultural and historical interest. Its beach on Bungus bay with its white sands is good for swimming, boating or just watching the fishing boats going out to sea in the afternoon. Small boats can be hired from here to some small islands nearby: Sirandah, Sikoai, Pagang, Parsumpahan. Padang is a prosperous city and major ports, which has retained the atmosphere of a market town. It is the third largest city of Indonesia with a population of more than 300,000. South of Padang, the massive Kerinci-Strait, Nature Reserve is Indonesia’s largest national parks sprawls across a 345 sq km stretch of Jungle Mountain dominated by the volcanic core of Mount Kerinci, which is Sumatra’s highest mountain. One of the most famous attractions in Padang is the renowned ‘Nasi Padang’. Numerous restaurants serve it. One of the most famous is Simpang Raya, which has branches throughout West Sumatra and Riau, but also in other cities in Indonesia. When we sit down at a table, in no time the waiter will fill the whole table with plates, containing Kari, chicken and fish prepared in coconut curry, Rendang, meat in coconut gravy and Dendeng Balado, thin slices of dried and fried beef served with red chilies. Since the 16th century Padang has been a trade centre. During the 16th and 17th century pepper was cultivated and traded with India, Portugal, the United Kingdom and the Netherlands. In 1663 the city came under the Dutch authority. The city came under British authority twice, the first time during the war between United Kingdom and the Netherlands (1781-1784) and again when the United Kingdom managed the area for the Netherlands during the Napoleonic wars (1795-1815). Afterwards the city was transferred back to the Netherlands. Up to approximately 1780 the most important trade product was gold, originating from the gold mines in the region. When the mines where exhausted, the emphasis turned to other products such as coffee, salts and textiles.